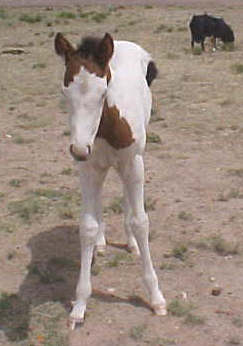 This is a filly that will want to be in your back pocket and be your best friend for sure! Her personality is as bright as her coat and she will really steal your heart! This very well put together medicine hat tovero will make a great performer, in shows or gymkhana or whatever direction you want to go. She has one blue eye and one brown eye. She is definitely a sparkling little jewel!